Are you pursuing or considering a career in the automotive industry? Do you need help paying for college? Then you’ve come to the right place. We are here to link tomorrow’s technicians to various scholarship opportunities, so you don’t have to leave college in a mound of debt. Browse through the scholarships listed below, and if you qualify for any of them, follow the link to apply today. The MAPA Educational Development Fund was established in 1991 at the Capital Region Community Foundation to enable MAPA’s charitable pursuits and provide college scholarships to employees and dependents of MAPA members statewide, pursuing undergraduate education. Applicants may be enrolled in any course of study. Additional consideration may be extended to applicants enrolled in Business Administration and/or Automotive Aftermarket Technology. One of the scholarships granted annually is in memory of MAPA founder Justin H. ‘Jud’ Morrison. MAPA is proud to announce there will be three (3) $1,000 scholarships awarded in 2019 in addition to (1) $500.00 for the Justin H. ‘Jud’ Morrison Memorial Achievement of Excellence Award. WHO MAY APPLY: Full-time employees, legal dependents of full-time employees, and currently employed seasonal full-time student employees of members in good standing of the Michigan Automotive Parts Association. Qualified applicants must be enrolled in a two or four-year undergraduate degree program at an accredited educational institution located in the United States. Such institutions must be tax-exempt under the Internal Revenue Code. The Automotive Aftermarket Association Southeast sponsors the AAAS Education Foundation Scholarship Program to assist students wishing to continue their education beyond the secondary level. A $1,500 cash award to any Antique Automobile Club of America (AACA) member, child, or grandchild of an AACA member in good standing for at least 5 years, who has been accepted to an institution of higher learning or is now enrolled in such institution. This award is granted by the family of John and Janet Ricketts in recognition of their love for AACA and their belief in service to the club. It is also in recognition of our first female National President, Janet Ricketts in 1999. Region or chapter membership is encouraged but not required. This award is granted by the AACA National Board of Directors. Region or chapter membership is encouraged but not required. One or more awards may be presented each year. A current AACA member, child, or grandchild of a current AACA member for a minimum of 5 continuous years. Accepted to a recognized accredited institution, or is now enrolled in such institution leading to a four-year college Bachelor’s degree or completion of a two-year vocational education program. 25 years old or less by December 31 of the year making the application. The recipient may only receive any AACA scholarship once. This award is merit-based, and while financial need may be considered, it is not a deciding factor. One or more awards may be presented each year. AmericanMuscle offers 4 currently enrolled students or high school seniors who are pursuing post-secondary education an opportunity to be awarded $2,000 in tuition assistance towards their upcoming semester. This scholarship is ongoing and is available for both the spring and fall semesters each year. Those students who have exceptional drive and ambition should submit a 700-1500 word essay to [email protected] telling us who you are and how you plan on using your automotive education to incite positive change and innovation within the custom car industry. All entries must be submitted as a PDF or Microsoft Word document to be eligible for consideration and must also be accompanied by proof of current enrollment in an accredited United States college or university. APSA of IL is the regional automotive aftermarket association for Illinois. If you are a resident of Illinois, meet the additional qualifications below, and submit a complete application, you will be considered by APSA of IL for this scholarship. Be enrolled or planning to enroll as a full-time undergraduate student in a curriculum leading to a degree in an accredited college or university. Provide a photo for APSA of Illinois use in publications. The APSA of Illinois Scholarship Program awards up to six $500 scholarships each academic year. Recipients may re-apply each academic year for up to four 4 years. The ASCCA Educational Foundation (ASCEF) is a nonprofit corporation dedicated to supporting and advancing the entire automotive industry. Governed by a code of ethics, the Foundation serves the industry through educational and training solutions, scholarships, endowments and professional development. The scholarship program is open to high school seniors who plan to enroll in post-high school technical/academic training or college undergraduates in the automotive service field satisfying certain criteria. Currently the Foundation issues eleven annual scholarships that can range from $500 to $2000 and can be applied toward tuition, tools and books. The deadline for scholarship applications for 2019 is MARCH 31, 2019. Art Fisher Memorial Scholarships are awarded each year to students preparing for automotive aftermarket careers. In 2017, 13 scholarships for $17,500 were awarded. About Art Fisher: Art Fisher founded Federated Auto Parts Distributors in 1985. Federated quickly became one of the industry’s premier programmed marketing groups, with more than 3,800 Federated Auto Parts Stores and 3,000 Federated Car Care Centers today nationwide. In addition to his work and dedication to Fisher and Federated Auto Parts, Fisher served on the board of governors of AWDA and served as chairman in 2001. The Automotive Hall of Fame program has specific scholarships for incoming freshmen and upper-level undergraduate students. All of the scholarships are based on financial needs and with the usual minimum GPA requirement of 3.0. Must have 3.0 GPA or higher. Please send an email to [email protected] with any questions or comments concerning scholarship applications. Scholarships are the root of our purpose in Automotive Women’s Alliance Foundation (AWAF). As an active professional foundation dedicated to supporting the advancement of automotive professionals, AWAF strives to motivate current and future students studying an automotive related field. These scholarships are targeted for Automotive Technology students who are enrolled in accredited automotive, heavy-duty or diesel programs. The scholarship is an important element in Bosch’s comprehensive strategy to prepare the automotive workforce of the future, support STEM education and help fill the anticipated need of qualified vehicle technicians and aftermarket professionals in the next five years. Be a full-time student in automotive, heavy-duty or diesel technician training programs at any accredited college, university, or ASE/NATEF certified automotive vocational program within the U.S.
Have a minimum overall GPA of 2.5 or higher. Provide a 250-word essay describing why they believe they should qualify to be a Bosch scholarship recipient. Provide at a minimum one letter of recommendation from a current instructor, employer or other non-family reference. The Breslow Foundation was formed to honor the memory of Barry Breslow. The scholarships honor the late Barry Breslow, an active participant in the automotive aftermarket for many years. Breslow, who passed way in December 2005, was one of the original owners of Autospecialty Inc. and a former chairman of the Auto International Association (AIA), now a segment within Automotive Aftermarket Industry Association (AAIA). He also was a member of the AIA Hall of Fame and a past recipient of the AIA Person of the Year. Qualified applicants must either be a graduating high school senior or have graduated from high school within the past two years. An exception to the two-year requirement will be made for military or religious service. Applicants must be enrolled in a 4-year college-level program. Graduate programs and undergraduate part-time programs do not qualify. Priority is given to students who plan a professional career in the automotive aftermarket, in categories such as engineering or business. The Breslow Foundation awards five (5) $2,000 scholarships each year. CJ Pony Parts is proud to offer two scholarships each year, each worth $500, to students who are enrolling in post-secondary education in their next semester. Any current student who is a U.S. resident and will be enrolling in post-secondary education in their next semester is eligible for this scholarship. This is open to all fields of study and is not exclusive to automotive or related degrees. See Other Rules and Regulations for more. What is your first memory of a Mustang? With the recent development of autonomous/self-driving vehicles, how do you see that changing the automotive industry? CJ Pony Parts has been around for over 30 years; where do you see yourself 30 years from now? As Lee Iacocca was the lead influencer for the debut of the Ford Mustang in April 1964, who is most influential in your life and why? You can be inspirational, funny, serious, educational, or even musical! Winners will be selected based on creativity and content rather than video editing skill or how many views the video gets. Submitted videos must be your own work. Upload your video to YouTube and then email the link to [email protected] before midnight EST on the appropriate deadline below. There will be one scholarship awarded in the spring semester and one scholarship awarded in the fall. The Garage Gurus Automotive Technician Scholarship Program awards twelve (12) students up to $2,500 to help support educational expenses for the 2019-2020 school year. at the time of application be (i) enrolled full-time at a US high school; or (ii) accepted or currently enrolled, either full-time or part-time, at an accredited college, university or trade school within the US. Trade school should be the equivalent of a two-year associate program. be in pursuit of an automotive technician degree or certification (or equivalent degree/certification). carry a minimum 3.0 grade point average. be a legal resident of the United States, in the United States on a student Visa or a resident alien. submit most recent transcript of all academic work. submit a completed application which can be found at www.fmgaragegurus.com/scholarship. submit two (2) letters of recommendation from non-family members. Gates Corporation funds a number of scholarships each year. In 2017, Gates awarded $16,000 in scholarships. The eligibility criteria are identical to the general UAF scholarship criteria: Applicants must be in or entering a full time post-secondary program at an accredited college or university or an ASE/NATEF certified automotive vocational school. Applicants must be planning a career in the automotive aftermarket. Gates prefers applicants training to become automotive technicians. KIAWA Education Foundation, Inc. was formed for the benefit of those students who are residents of Kentucky or Indiana and are seeking to further their respective careers in the Automotive and Truck Aftermarkets. KIAWA offers two scholarships annually in the amount of $2,000.00 each, one for a Kentucky resident and one for an Indiana resident. Qualifications for the scholarships are listed below, and if qualified, you may submit a complete application for consideration. Be a resident of Kentucky or Indiana. Be a high school graduate or possess a GED certificate. Be enrolled or planning to enroll as a full-time undergraduate student in a college-level program or an ASE/NATEF certified post secondary automotive technical program. NATEF – the National Automotive Technicians Education Foundation – sets standards for automotive education program, and ASE – the National Institute for Automotive Service Excellence – certifies schools, which meet these standards. See www.natef.org for a list of certified programs. Submit your high school transcript, and your post-secondary school transcript if you are already in a post-secondary program. We accept copies of transcripts. Submit two letters of recommendation from non-family members. Only one may be from your church or minister. Best recommendations come from people associated with the automotive aftermarket industry. All scholarships awarded will be paid directly to the successful candidates academic institution upon verification and proof of satisfactory enrollment. Automotive Training Center is always looking for tomorrow’s brightest technicians. And every year from October through April, ATC conducts an annual High School Senior Scholarship Program. If you’re an active high school senior, you’re eligible to participate in the program. Ideal candidates show a high level of aptitude and a desire to succeed in the fields of automotive, hi-performance, diesel, collision repair, or marine service technology. The Jim Moss Scholarship was created to pay tribute to an Aftermarket Legend. Jim’s passion for the Aftermarket and the Heavy Duty industry as a whole combined with his willingness to share his knowledge and expertise with others was remarkable and is well deserving of recognition. Be a graduating high school senior or have graduated from high school within the past two years. Those serving our military are exempt from this requirement. Applicants must be enrolling in a four-year college-level full-time program. Those pursuing graduate degrees or part-time programs do not qualify. Two $500 scholarships are awarded each year. The Midwest Automotive Parts & Service Association sponsors the MAPSA Jack Thayer Memorial Scholarship Program to assist students wishing to continue their education beyond the secondary level. An MAPSA member, an immediate family member of an MAPSA member, full time employees of MAPSA members, or an immediate family member of a full time employee of an MAPSA member. Please include a photo as an attachment or forward by mail to the MAPSA Office. Scholarship Awards- Scholarship(s) will be awarded each academic year to qualified undergraduate students who have applied or enrolled full time at an accredited college or university and are working or planning to work toward an Associate or Bachelors degree. A minimum of one $1,000 scholarship will be available each academic year. The scholarship will be payable to the college of the recipients choice or directly to the recipient upon proof of the recipient’s paid tuition. Contact MAPSA for more information. The Marilyn Schwartz Memorial Fund was established within the University of the Aftermarket Foundation to award scholarships in honor of Marilyn Schwartz, wife of aftermarket veteran Mort Schwartz. Eligibility Criteria: Open to students attending the University of Northwestern Ohio, or high school graduating students planning to attend UNO, and enrolled in the Heavy Duty / Diesel training program at UNO. Students should have a minimum 2.5 GPA. Two $1,000 scholarships are awarded each year. Two $1,000 scholarships are awarded each year to collision students. Qualified applicants must be a graduating high school senior, or have graduated from high school or received a GED certificate. Applicants must be enrolled or planning to enroll as a full time student in a 2 or 4 year college or an ASE/NATEF certified post secondary collision repair program. NATEF, the National Automotive Technicians Education Foundation, sets standards for automotive education programs, and ASE, National Institute for Automotive Service Excellence, certifies schools that meet the standards. Certified schools are listed at www.natef.org. Staff members of Global Automotive Aftermarket Symposium sponsoring associations and their family members are not eligible. The Michael Busch Memorial Scholarship fund was created in memory of the son of a former collision shop owner and ASE board member, Jim Busch, who operated a shop in Issaquah, Washington until his retirement. His son, Michael, was an automotive technology student who tragically lost his battle with cancer. This annual scholarship is offered through Mitchell 1 and is presented at the annual NACAT Conference and Awards Dinner. The scholarship recognizes one U.S. or Canadian high school senior for outstanding achievement in automotive technology / auto shop repair scholastics. The winning student receives a $2,500 scholarship, a check for $500 and roundtrip airfare and accommodations for the winner and a guest to attend the NACAT conference. NYSAAA is the New York State Automotive Aftermarket Association Scholarships. If you are a resident of New York and meet the additional qualifications below, and submit a complete application, you will be considered by NYSAAA for their scholarship offerings. The John J. Lorenzen and Debbie J. Tranello Memorial Scholarship Funds are to financially assist those persons wishing to continue their education beyond the secondary level in pursuit of a career in the Automotive Aftermarket, which encompasses the replacement parts distribution industry and the high tech diagnostic repair industry. A high school senior who has a good academic standing and is currently involved in a class which may be related to the automotive industry. Enrolled or planning to enroll full time in an accredited college or university, and working or planning to work toward an Associate or Bachelors degree. A high school graduate or holding a GED certificate and currently employed in the Automotive Aftermarket Industry. A high school graduate or holding a GED certificate and are recommended by a current NYSAAA member. Committed to a career in the Automotive Aftermarket Industry and enroll in a college or a university that will prepare a student for such a career. There will be a minimum of one scholarship awarded per fund each year. The dollar amount will be determined by the yearly amounts of contributions and will be made payable to the attended college. An amount of $1,000 each will be the minimum goal. In 1995, the Association of Diesel Specialists and the Ortner Foundation’s trustees approved the Ortner Scholarship Program. 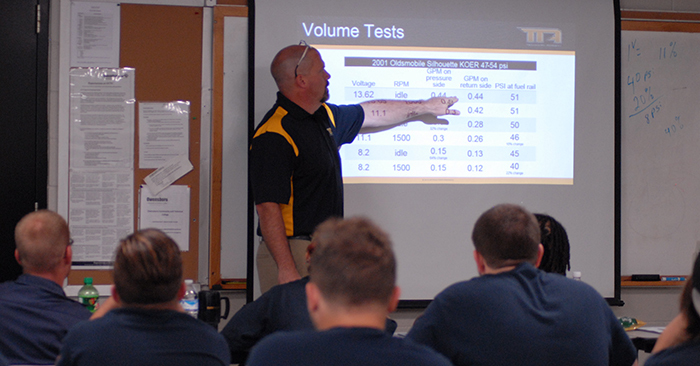 The scholarships, administered by the ADS Technical Education Committee, seek to recruit new students into diesel training programs at ADS Technical Training Members Institutions. A total of 25 scholarships are offered each year. Twenty of these scholarships are available to first-year students and five are available to second-year students. Be enrolled as a first or second year student at an ADS member school. Submit an application and transcripts of prior education experience for review by the Technical Education Committee. The University of the Aftermarket Foundation has established memorial scholarships to honor the distinguished career of Bob Wilkes, former chairman of the Brake Manufacturers Council (BMC) who passed away on Dec. 2, 2017 at the age of 64. In 2019, two $2,000 scholarships will be awarded. Qualified candidates must be planning a career in the automotive aftermarket and must be entering or attending a full-time, post-secondary program at an accredited 2-year or 4-year college or university or an ASE/NATEF certified automotive vocational school. Applications approved by the University of the Aftermarket Foundation (UAF) Scholarship Committee will be submitted to the UAF Board of Trustees for approval. College is expensive, and SEMA can help! Earn up to $5,000 for School. Every year SEMA helps students pay for their college tuition, and helps SEMA Members pay off their student loans. Students from all academic and technical disciplines that lead to careers in the automotive industry are welcome to apply! Incoming freshmen or continued enrollment in college, university or post-secondary career and technology school in the U.S. Pursuit of degree or certification that leads to a career in automotive. All disciplines welcome! Show your passion for automotive! ShearComfort is giving away a $1,500.00 scholarship to a student enrolled either in an engineering program related to the development of vehicles (mechanical engineering, automotive, aerospace, production, electrical, etc), Automotive Technology, or a similar program related to the automotive industry at an accredited college or university in Canada or the United States. The award will be given out to two different students per year. Essay submission deadlines are October 15th for the Fall semester and April 15 for the Spring semester. Every year, Woman in Auto Care awards multiple scholarships for high school and post-secondary female students. When the scholarship program began, they awarded $10,000. The organization has increased funding for these scholarships to over $60,000 and growing.